Maybe because it's winter and that's a naturally dreary time of a year, but I enjoy a good dystopic novel every once in awhile. The Unit filled that hole quite nicely. Set in the near future, Dorrit, a 50 year old woman with no family or children, enters the Second Reserve Bank Unit. The unit is a government established program for elderly "dispensibles," or those without families, to donate their vital organs and participate in clinical trials and pharmaceutical experiments. Though it's a terrifying place, the unit is set up to be quite comfortable to its residents - plenty of free food, accessible health care, expensive clothing and spacious apartments. 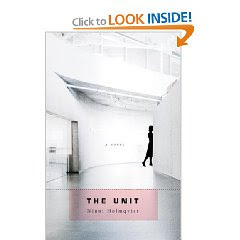 When Dorrit falls in love with another resident, she begins to question the whole notion of the Unit...and that's when things start to get a little bleak. There are bright spots throughout the novel, but overall, as the genre dictates, the book is kind of depressing.